:Wooton is blending up a mix of men of God who made history. From the journey of early church martyr Telemachus and the defiance of Valentine to the amazing prayer lives of George Mueller, William Tyndale, and Charles Finney, you will learn that standing for your faith no matter the circumstances takes amazing bravery. For more historical fun facts, visit Whitsend.org/Wooton. Wooton's Whirled History includes a compilation of previously released episodes with new introductions to each episode by Wooton. Also included is a discussion guide for parents and teachers to use as they talk through the choices made by these courageous men and women. Episodes include ?Telemachus,? Part 1 and 2; ?The Last ?I Do?? ; ?Saint Patrick: A Heart Afire,? Part 1 and 2; and ?When In Doubt ... Pray!? 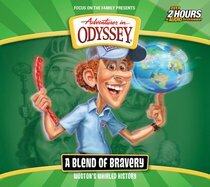 About "A Blend of Bravery (#01 in Adventures In Odyssey Wooten's Whirled History Series)"